Traditionally styled blocks are as beautiful as they are practical. Classic Boat Supplies stocks a wide variety of wooden blocks, Tufnol blocks and small bronze blocks. Our wooden blocks cover a range of rope sizes from 8mm through to 26mm. They are simple and easily maintained, and with 3mm thick stainless steel bindings, incredibly strong. Rather than roller or ball bearings the ash blocks use large-diameter free-running stainless steel spindles. The sheaves are made from a Tunol-type material which is kind on ropes and hard-wearing ertalon on the larger blocks. The shells themselves are made from hand-picked ash, glued and screwed together. The wood is coated in thick high-gloss varnish. The Tufnol blocks provide a long-lasting and economical rigging solution but still with that traditional look. They have a strong stainless steel frame with brass bush bearings. A variety of styles including single and double blocks with and without beckets, swivels, etc. means you are sure to find a solution for your classic boat. Our Tufnol blocks work with ropes ranging from 10mm to 16mm. Beautiful small bronze blocks are also available. Handling ropes or 6mm and 8mm, these are cast either with or withous a becket. 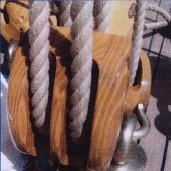 Browse our range of traditional sailing boat blocks. If you don't see exactly what you need please contact us. Other products are available that are not yet listed.